How to post-process recognized characters in OCR to Any Converter? With the help of the powerful program VeryPDF OCR to Any Converter, you are able to extract characters from different kinds of images like BMP, GIF, JPG, TIFF, PNG, etc. or scanned document like scanned PDF and then save the recognized characters to editable documents like Word, Excel, RTF, etc. OCR to Any Converter is good at post-processing recognized characters before saving them as target file and it supports spell check which means you can check the mistakes and then modify the characters with the given right choices. Additionally, you can use OCR to Any Converter to set the font size, font style, font color, etc. parameters. This article aims at showing you the detailed operations about post-processing recognized characters. 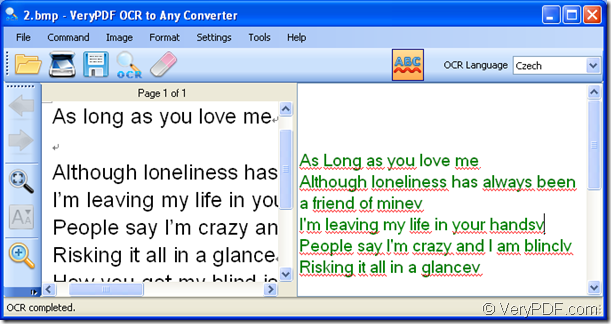 To know how to use OCR to Any Converter, please read this article or this article. For example, there is an image which has been OCRed and you can see the recognized characters on the right window of OCR to Any Converter interface. Now you can do like the operations shown below. Please see the recognized characters in Figure 1. To check spell mistakes, you can click the button to show all the spell mistakes in the recognized characters. If you don’t think there are mistakes among the characters, you can not change them. If there are, you can right click the marked word and choose the right one from all recommended offers in the popup floating item. You can also change the font parameters for recognized characters. 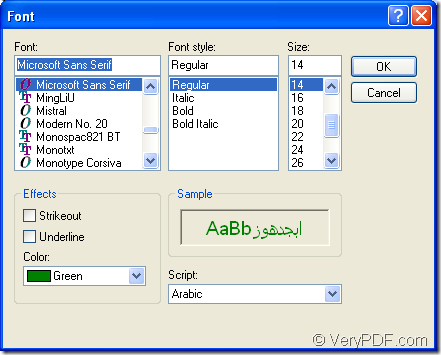 Please click Format—Font to open Font window like the one shown in Figure 2. In Font box, you can choose the font for the characters. 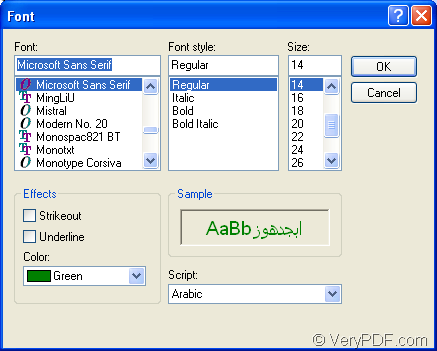 In Font style box, four kinds of font styles are supported. In Size box, you can choose a suitable font size for the characters. In Effects box, you can set font color, or choose strikeout or underline effect. In Sample box, you can see the specified font sample. Then please click OK button to save parameters and close the window. Then you can save the target file as Word, Excel, RTF, etc. document at once. 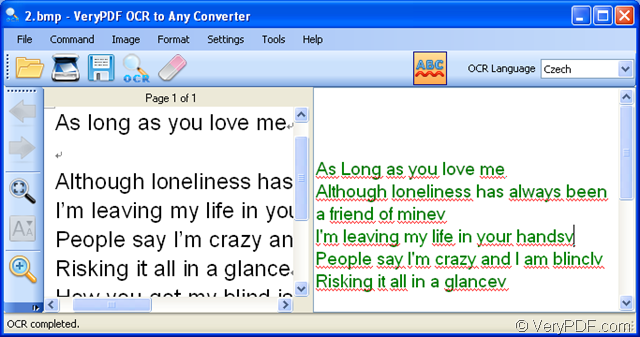 For learning more information about OCR to Any Converter, please click here. There are also some OCR products you may be interested in like PDF to Word OCR Converter, Image to PDF OCR Converter, Scan to Word OCR Converter. How to OCR a PDF file using Command Line software? How can I convert a PDF file in Japanese to doc? This entry was posted in OCR Products and tagged OCR to Any. Bookmark the permalink.